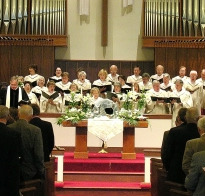 At Saint Mark UMC, we want to lead through musical experiences and enhance the worship experience of congregations by using our God-given talents the best we can. These children present anthems in worship, present two musicals each year, participate in Music & Arts Week at Camp Sumatanga and a Children’s Choir Festival. The Festival is for children grades 1-6 and is a District event. In May, 4th -6th grade can participate in Young Voices Festival at Auburn. This event is statewide. Our church provides music and materials for all these activities. Our youth, spanning 7th to 12th grade, are in GodSpeed. They are the service choir in traditional worship. 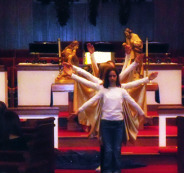 They present a Worship Concert and teach Vacation Bible School on Choir Tour annually. Out of this group is an auditioned Praise Team that leads in Youth Worship and helps in other worship events. The GodSpeed Handbells rehearse regularly. 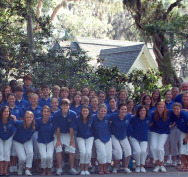 These youth participate in Music & Arts Week at Camp Sumatanga each summer. Saint Mark provides vouchers for active youth and children for this camp. The experiences there have enriched the lives of the children and youth and, consequently, Saint Mark. Chancel Choir, Men’s Club Choir, Women’s Ensemble, Adult Praise Team, Brass Ensemble and Handbells. Of course, all these opportunities are available because of a fantastic and dedicated team of volunteers who give time and talent to make worship arts a reality at Saint Mark. Come join us. There is a place for you!